Update – Looks like the company has received all the applications it needs and has taken down the job listing. For more jobs like this one, be sure to check our Daily Jobs & Gigs page. We post new leads every morning except Sunday. May you be working from home soon! If your background includes assisting C-level executives (CEO, COO, CFO, CIO, etc. ), you can put that experience to work as a Virtual Executive Assistant at Equivity. Currently, they are looking for people who can work 9AM – 6PM Eastern Time. The job listing mentions “East Coast,” but this refers to the time zone for working hours rather than where you have to live. Starting pay is $15/hour. You would be hired as a part-time employee of Equivity, not an independent contractor. Equivity is looking for a part-time executive assistant who has directly supported C-level executives and is experienced in a wide range of administrative activities including calendaring, organization, project management, email correspondence, and document creation. In addition, we are looking for an executive assistant well versed in Salesforce, including experience in conducting searches, running reports, sending out email blasts, and managing records. If you have excellent communications skills, a background in the administrative tasks mentioned above, and thrive in a work-from-home environment, we want to hear from you! Equivity matches clients with virtual assistants that provide administrative support. Our virtual assistants work with a high degree of autonomy and are responsible for developing relationships with our clients. Because we provide extremely attentive service to our clients, you must be available to respond to client communications promptly throughout the business day and certainly within one hour by email, phone, and text. All of this work is done remotely, meaning that you can work from home. The selected candidate would be hired as a part-time employee of Equivity, not an independent contractor. We are looking for somebody who has at least 20 hours per week of availability, and the starting pay is $15 per hour. We are a growing business and are looking for an executive assistant who is excited to partner with us and is interested in a long-term role with our company. 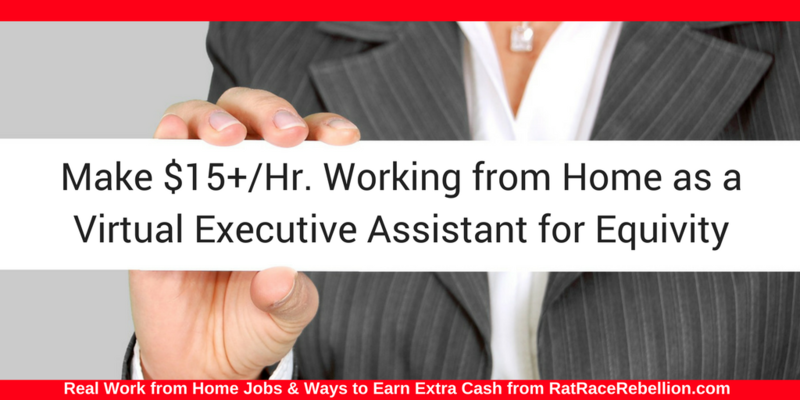 This entry was posted in Administrative & Clerical Jobs, Virtual Assistant, Work at Home Jobs and tagged Equivity. Bookmark the permalink.